NEW YORK, NY (March 15, 2018) — Today, as reports continue that President Trump is considering replacements for VA Secretary David Shulkin, IAVA released a groundbreaking poll of more than 4,000 members of the post-9/11 veteran and military community. The poll, which is the only public and current poll of its kind, comes after an Inspector General report revealed the Secretary misappropriated funds for his personal travel, multiple additional IG reports have grabbed headlines, and in the midst of reports that President Trump may have asked current Energy Secretary Rick Perry to lead the department. 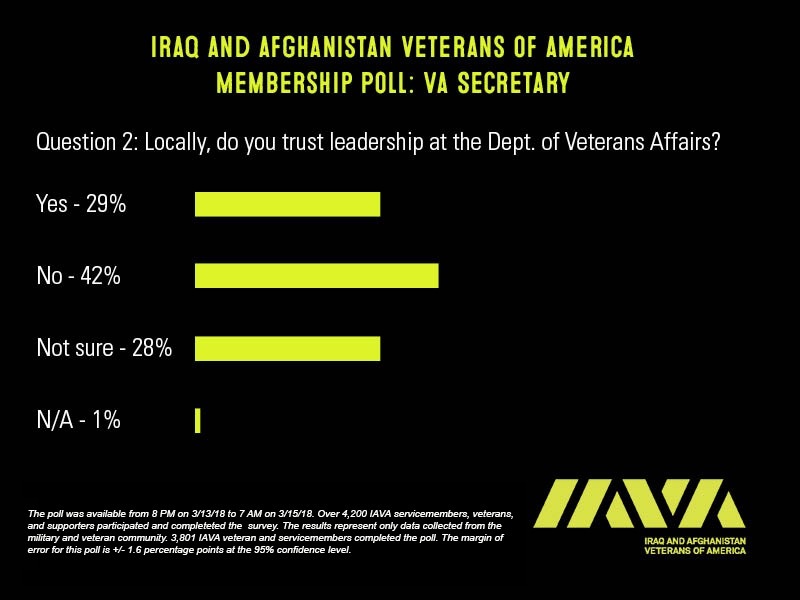 The data, available online here, revealed that IAVA veterans have diverse views, but the majority do not trust VA leadership nationally or locally. Only 24% of veterans surveyed approve of the Secretary’s performance, 41% disapprove or strongly disapprove of the Secretary’s performance to date, and a third of veterans surveyed are not sure how they would rate the VA Secretary’s performance. Local leadership fared better, but is still failing to meet the high standard veterans rightfully expect. 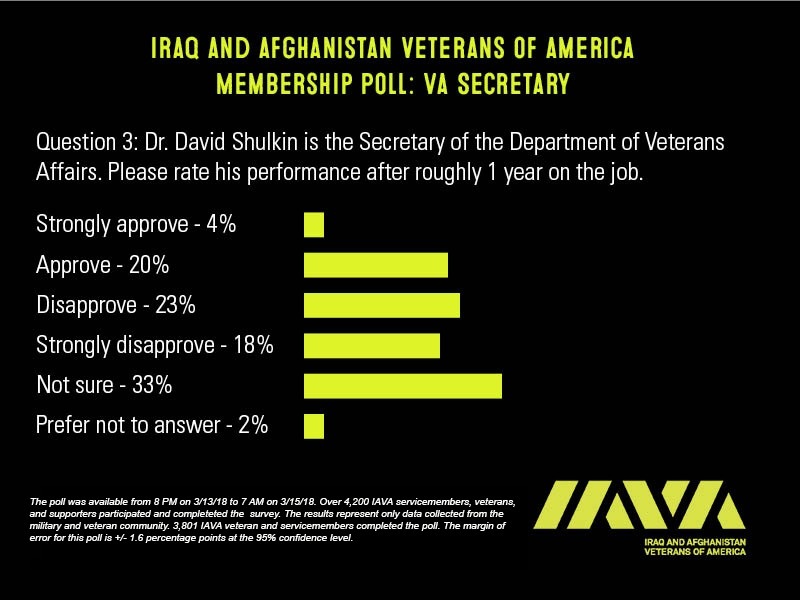 Notably, as the President considers replacements, IAVA data also shows that the majority of veterans think the VA Secretary should be a veteran, and that the majority of IAVA members do not support privatizing VA. 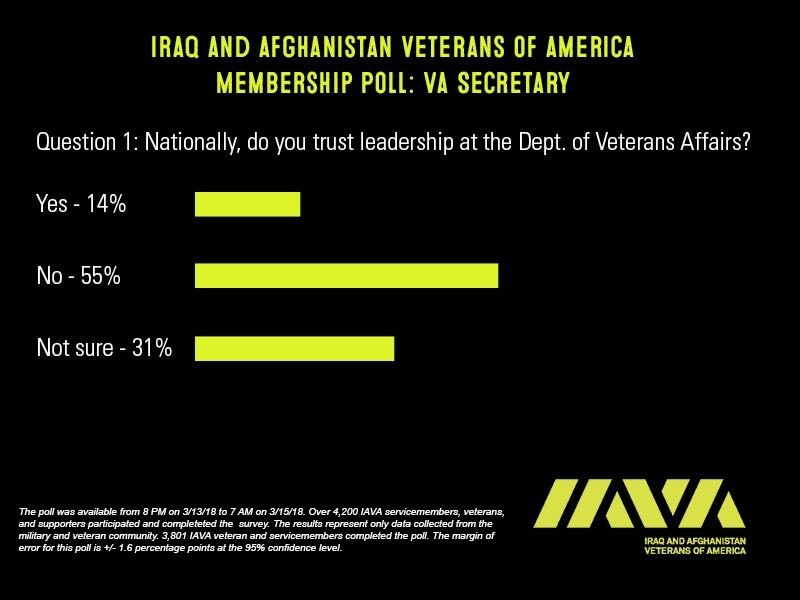 Methodology: Emails were sent to IAVA’s members inviting them to participate in IAVA’s poll on VA leadership. The poll was also made available to members on IAVA’s internal platform: myIAVA. The poll was available from 8 PM on 3/13/18 to 7 AM on 3/15/18. Over 4,200 IAVA service members, veterans and supporters participated and completed the survey. The results represents only data collected from the military and veteran community. The numbers reported here are from 3,801 IAVA veteran and service members who completed the poll. The margin of error for this poll is +/- 1.6 percentage points at the 95% confidence level. IAVA Research: Led by Stephanie Mullen, IAVA’s Research Department uses real data to drive the development of scalable solutions to benefit veterans and their families. Through careful analysis of IAVA’s annual Member Survey and continuous surveillance of data about service members, veterans and their families, IAVA’s Research Department informs the development of IAVA advocacy campaigns and programs. IAVA’s groundbreaking 2018 annual Member Survey will be released later this month; details to come.